Effective sales writing is crucial to the success of capturing the attention of your target audience through a sales letter. This is the main reason why a sales writing certification program is extremely useful to anyone who wishes to become an expert in writing sales letters. Sales writing is actually the art of creating letters with contents that aim to persuade the recipient to purchase products and services from a business or an organization. A sales letter is something that should be carefully created. You cannot just write a pointless sales letter and assume that this will serve as a useful tool in capturing the attention of your target audience. Effective sales writing requires you to learn the basics of properly formatting your letter and improve your skills in informing your target market about the existence of your products and services without annoying them. Taking up a sales writing course is indeed a major help when attempting to learn everything about writing a sales letter in a more professional and persuasive manner. It should also be noted that a successful and effective sales writing lies on preliminary planning and thorough thinking. It would be possible for you to write a professional and persuasive sales letter if you know your products and services well and you are aware of its best features. A sales writing certification program is also a major help in improving your skills in differentiating your products from the competition, assessing their strengths and weaknesses, analyzing your potential customers, determining their specific requirements and how you can offer them the best services. You have to put some effort in writing your sales letter to increase your chances of grabbing the attention and loyalty of your target market. This is the main reason why you should consider getting your sales writing certification from Brainmeasures. With the help of the sales writing certification program from Brainmeasures, you will be able to enhance your skills in writing professional sales letters while making sure that the contents won’t end up annoying readers. 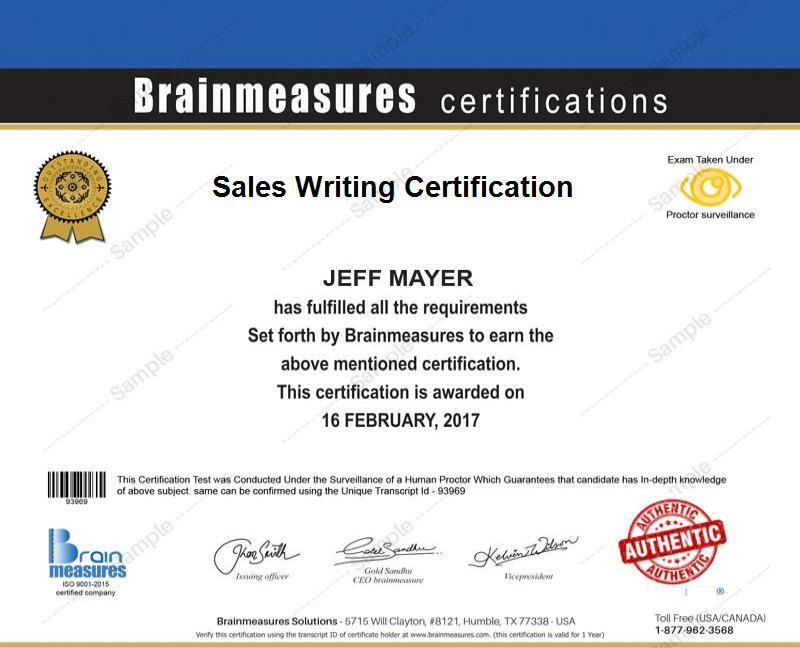 Brainmeasures is a legitimate online certification company so enhancing your sales writing skills will no longer become an extremely difficult process. As a means of assessing your skills in writing an effective, professional and persuasive sales letter, Brainmeasures will require you to take and pass a sales writing exam before rewarding you with your certificate. The sales writing certification program benefits anyone who wishes to become a part of the sales team since this program will inform them about the many things that they can do to improve their ability to write an extremely powerful sales letter and increase their sales through it. By learning the basics of writing an extremely persuasive sales letter, you will no longer find it hard to capture the attention of your prospective customers and satisfy them. Before you enroll in a sales writing certification program, it is best for you to determine the average salary for the professionals in this field so you will know exactly what to expect once you start practicing your career. The average annual salary for a sales writing expert is $68,000.